I have been asked multiple times by people inquiring about hiring a seamstress. These include using small shop seamstress services or having small run manufacturing done using an outside seamstress. Hiring a seamstress can be tricky. I want to take the opportunity to address most of these questions and/or concerns in hopes that you will be best able to make an informed decision when hiring a seamstress of your own. These are some of the most common questions asked by small shops considering hiring a seamstress. This list is not all inclusive. I hope this helps many of you make more informed decisions when hiring a seamstress in the future. Can you recommend a seamstress in my area? Often when a small boutique or shop is considering hiring a seamstress it is because they have orders that are beyond what they personally can handle. They need help. For many of these individuals, their boutique and/or shop is their baby. It is a member of their family. It has taken as much of their blood, sweat, and tears as any one of their children have. It is hard for them to reach the point of accepting that they need help. Usually they are desperate for someone. They have orders coming in, orders that needs to go out, and there is not enough of them to go around. Most often, the types of shop owners want a seamstress that is local for them. It is convenient. Or is it? I will address that further down the list. Suffice it to say that I often get asked: “Can you recommend someone in my area?” This comes when I have already given them a rough estimate of my costs to provide them services. They find out that I am not local. They want someone local. The resounding answer to this – most likely not. A seamstress who is not local to your area is not likely to know of many good seamstresses in your area. You are going to have to do a little research on your own. How do I find a seamstress locally? Join Facebook Groups related to sewing that are also local to you physical location. Most seamstress groups on Facebook are closed groups. You will have to provide a little bit of information – usually 3-4 questions about your business and needs. Answer the questions, you are going to be asked similar questions when hiring a seamstress. Accept that you will now have to give out more information than that to anyone that you employ. It is usually pretty simple to find local Facebook Groups. I recommend that you join several. They can be beneficial to you for more concerns above and beyond hiring a seamstress. For example, I am active in one entitled: DFW Sewing (Dallas/Fort Worth). This group is a great resource for seamstresses, both professionals and hobbyists, located in the Dallas-Fort Worth, TX area. Information about sales, specials, etc are shared. It is a group with members of all skill levels and professions. It is great for networking. When you are searching Facebook for Groups, you are looking for sewing and/or craft groups. You could also look for Sewing Guilds near you. Most Sewing Guilds have Facebook Pages. Remember that often shop owners use seamstresses that they hear about via “word of mouth” because they have a reputation of being of good quality. There is no licensing required to perform seamstress services for others. Keep this in mind. You want to make sure that any seamstress you find is a good fit for you and your business. You want to find one that provides consistently reliable and quality work as opposed to someone that provides the fastest turn around. There are no seamstresses local to me, what now? The common problem when searching for a local seamstress is simply that there are none. At least not within the convenient 10-15 mile radius of your home and/or shop. If you can find one, are they any good? That is the more important question. Be aware that many shop owners ship to their seamstresses out of necessity. You are responsible for making sure that your seamstress has these items. You can make arrangements with your seamstress for reimbursing on items that are not shipped/provided by you. I find that I prefer my own serger thread. I prefer to have matching thread for my sewing machine. I require 5 cones of thread or 4 cones and 2 spools of matching thread for all projects. It is easier for me to charge a thread fee per item. Often you will not require the use of the entire cone/spool each project. With a small thread fee per item, there is less stress for you, making sure your seamstress is always stocked. If you have colors that are hard to match, I request that those be provided based on what you as the shop owner desires. These items are the same items you would have to provide for any local seamstress. Shipping is expensive, will hiring a seamstress locally save me money? Many shop owners have supplies drop shipped direct to the seamstress to only pay shipping on the supplies once. Often distributors offer free shipping. Shop owners take advantage of this and thus only have to pay shipping for the return of finished goods. This does mean that the seamstress is often doing more work – cutting project pieces. Please be mindful of this when you drop ship items that you include this added work in the wages that will be paid for the seamstress. Each has their own fees that they charge for items/services. What a seamstress is spending in time and gas to meet you somewhere, is time and money lost. Consider that carefully. If you have a seamstress that meets you weekly for pick-up and drop-off of supplies for your projects, and they have a 30-45 minute commute to meet you, that’s 60-90 minutes of lost sewing time just to return your project to you. At a going rate of $15-20 per hour, that is $15-30 of lost wages or rather time that could be used to earn those wages. This does not include the cost of gas on their own vehicle. How many more items can your seamstress complete for you in that time? How many items or other business tasks can you complete in this time? Often times, a seamstress that you ship materials to is more cost effective. I personally have learned this from experiences of working for local shops the past several months as the seamstress doing deliveries and pick-ups. Even meeting half-way is inconvenient at best. It is lost time. It is spent gas. It is time that is rarely reimbursed. Thus, I am considering applying a delivery fee to each local order. This does require planning and coordination on your part to make sure that supplies are received with adequate time for completion and delays in return shipping. Return shipping windows should be no less than 1 week in most areas of the United States. I will not venture to speculate on shipping to Canada, Mexico, or other worldwide areas. If you have to allow for 1 week for shipping and your project requires 5-7 business days for completion, and it takes 1 week for expected delivery on the front end, that is 3-4 weeks on any given turn around. You as a business owner must plan accordingly. Often I have found that the desire to not ship is due to lack of time. They want to be able to drop off those emergency projects. That is great, but rush projects should come with added wages. Keep that in mind, the next “emergency” you encounter as a shop owner. How do I know that the seamstress is good or even reliable? I want to assure you people go where they can find reliable and consistently good work. Anyone can say they are a seamstress. Not everyone can say that they are a good seamstress. Even fewer can say that they are an amazing seamstress. Unfortunately, here in my local area (Dallas, Texas and Fort Worth, Texas – yes, 2 major metropolitan cities), finding a quality seamstress is difficult. Good seamstress is hard to find. Those who are good are booked for months out. This is an universal problem in the small run manufacturing industry. Good seamstresses are hard to come by and have a huge demand on their services. Deciding whether or not a seamstress is any good requires trial and error. Send the seamstress a single project to complete. Don’t forget to pay them. You are going to receive a completed item in return. Send multiple items if you have multiple items that require differing skills and techniques. Again, don’t forget to pay the seamstress. You are receiving a completed, saleable item in return for the trial. Remember that not every good seamstress is good at everything. Not every amazing seamstress is amazing at everything. This is why a trial run is so important. Is your selected seamstress good at what you need them to do? Ask around and try one or two on for size. What is involved in working with a non-local seamstress? There are a few things that are required when working with a non-local seamstress: trust, patience, planning, clear directions, timely shipping, and timely payment. You, as the shop owner, must have a certain amount of TRUST hiring a seamstress to do the work for you. You have to trust that you are going to receive a good finished product in return for your investment. This trust is required no matter if you use a local seamstress or one that is across the country. Your seamstress may be the best one available, but they are just now seeing your project(s) with your directions and are learning your expectations. There might be bloopers from time to time. These are learning experiences for both of you. Embrace them for what they are and adjust accordingly. Worry should be if the bloopers last more than 1-2 batches of a single project. Every seamstress has a bad day, but most know when they should stop working or shouldn’t be working at all to help minimize accidents, screw-ups, etc. Find out what is going on with them before jumping to conclusions. You have to let go of complete control of your product. Once you hire your first seamstress, you are no longer 100% in control of the final product. You have to relax and trust that they will do the job hired for. You have to give clear and precise directions and trust that your hired seamstress will turn out the product you hope for. Many times, a good seamstress will turn out a product better than you instructed. That takes skill and experience. When hiring a seamstress, you are hiring a sewing professional. Treat them accordingly. I would be weary of hiring anyone with less than 5 years sewing experience. I would be less worried with a seamstress with less than 1 year of professional seamstress experience if they have been sewing personally for 5, 10, or 20+ years. Their experience speaks for itself. Be sure you pay them accordingly. This would be the same if you use a local seamstress or one across the country. You have to communicate with your seamstress. They have to be someone that you can communicate well with. Each seamstress is a living, breathing individual. They are each different and unique. Your communication, should include clear directions on expectations, timelines, changes, and special requirements. It is important that you KNOW exactly how long each item takes to produce – not at your fastest, but when paying close attention to detail. This is important communication. If you are not a sewing individual, trust that your small shop seamstress knows what they are doing even if the timeline for completion is double of what you expected. Often the first 2-3 batches of like items are all about improving techniques specific to your product. The smaller your batches, the longer this takes. 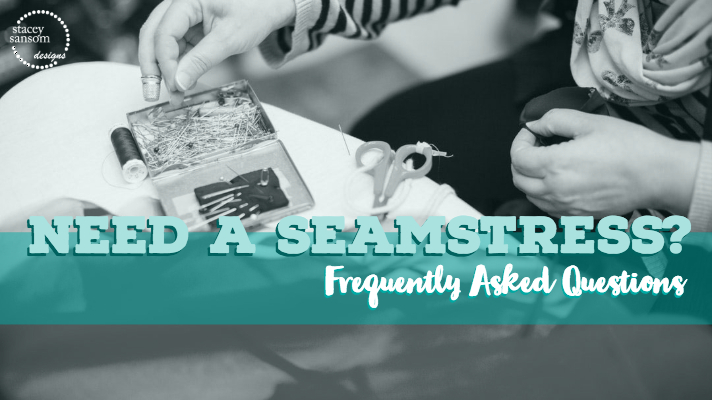 Your seamstress should ask LOTS of questions! Sometimes annoying amounts of questions. Questions are where your seamstress gets clarification on what you want. Communication, keeps everyone up to date on the status of each project. This is the same for my local vs out of state customers. Your expectation should be the same for either. What a I paying for when hiring a seamstress? When hiring a seamstress, you are paying for their professional sewing experience. Period. A seamstress is a sewing professional. The cheapest rate does not always yield the best results. You can have cheap. You can have fast. You can have quality. You usually cannot get all three at the same time. Be mindful of this. As a shop owner, it is your responsibility to cover all expenses related to your project(s). Not just some of them. This includes, but is not limited to: services provided, products provided, shipping, etc. You are paying for a finished product to be returned to you. If a seamstress incurs additional costs because you forgot to include the matching thread, bias tape, or whatever, this expense is still yours. The seamstress must be reimbursed for these. It your product. They are part of your product cost. Don’t cheat yourself by underestimating your product costs and certainly don’t cheat your seamstress. What is the cheapest way to ship? That is entirely up to you, your location, and where you are shipping to. The same is true for return shipping – prepaid by you. You will have to do some research on what is most cost effective based on the products you are having shipped. Most small shops ship via USPS in flat rate boxes. This is very cost effective. There are a variety of different sized flat rate boxes (and envelopes) available to you and your seamstress for no cost from the USPS. Do not anticipate that they will be able to return the product in the same box and simply apply a new label. It rains. Packages get thrown around. Some envelopes take an act of god to open. Be prepared to cover all of the cost of shipping. This is built into your product price. I personally have a large variety of boxes. I protect your products inside zippered plastic bags – dirt and moisture protection – to protect your items in case of shipping package damage. I simply tell my shop owners what size box(es) I am using for their finished goods. They send the prepaid label(s) via email. I print the return label provided to me and put it on the box that is appropriately sized for the finished items. I then schedule a USPS pick-up from my front porch the very next morning. It is amazingly convenient – no lines, no drives, no waiting, no stress. What can your seamstress complete for you in the time spent driving to meet you for drop-off and pick-up? For me, shipping finished products is a time savings of 60-90 minutes each trip. Most product runs have 2 trips – pick-up and drop-off. That is 120-180 minutes – 2-3 hours of lost time. Is that 1 more product you can sell? Is that 5 products that you can sell? Keep this in mind when you are trying to make the decision on hiring a seamstress – local or non-local. Keep this in mind even with your local seamstresses. I am Stacey Sansom. I am the owner and seamstress at Stacey Sansom Designs. I have been in business since July 2009. Prior to 2017, I was solely in the web design and graphic design industries. I started making the transition to seamstress work in mid-2017 and started offering small run manufacturing services in March 2018. I have been sewing for approximately 30 years and I have been quilting for 20 of those years. My mother was an amazing seamstress. My older sister is also an amazing seamstress. I learned from their teaching, example, experiences, and guidance. I slowly transitioned to seamstress/sewing work to help reduce the stress in my life – doctors’ orders. After 23 years in the web design industry, I needed a change. I wanted to stay in the graphic design industry full-time. In 2016, our family made an across-state move and my little business struggled to gain new graphic design clientele. In order to save my small business, I made the full-time shift to something I saw a need for in my “new to me” local area.I am very happy in the sewing industry. I meet lots of unique and wonderful people. I get to work on a variety of projects. I get to make people happy every single time I return product batches back to their associated shop owners. You can find additional information about me on my About Me page, here on this website. Be sure you subscribe to my email newsletter for exclusive savings offers on services and/or products. For behind the scenes views and updates be sure to follow us on Facebook and Instagram.